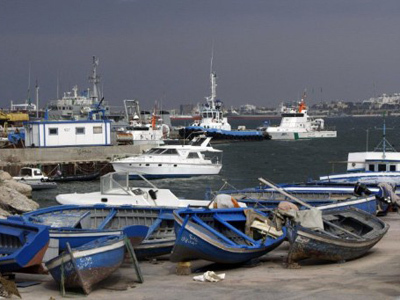 Rebels say up to 85 per cent of Tripoli is under their control, except for Gaddafi's Bab al-Aziziyah compound. They also claim to have taken control of the state TV building. Eyewitnesses are tweeting that an “Independence” flag has been raised on Abdel Ghani mosque. Some estimates put the death toll from this weekend alone at more than 1,300 people, with around 5,000 injured. Two of Gaddafi's sons have reportedly been captured by the rebels. According to the Libyan leader’s spokesman, Gaddafi is prepared to negotiate directly with the head of the rebel transitional council, but says the rebels are not ready to listen. The International Criminal Court says it can confirm that Gaddafi's son Saif al-Islam has been arrested. Earlier on Sunday Saif al-Islam Gaddafi, the Libyan leader’s son and a well-known face in the West, has been captured, the head of Libyan rebel national transitional council told the Al Jazeera television network. 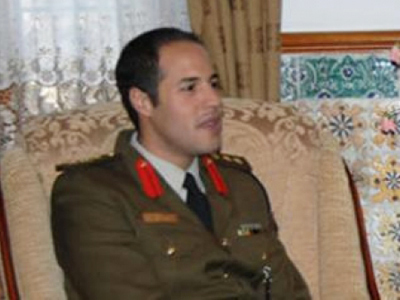 Afterward came reports of Saadi Gaddafi being captured in Tripoli. Mohammed Gaddafi has surrendered to the rebels and his movements are being controlled. According to recent reports, rebel forces entered the city center and claimed that Gaddafi’s presidential guard had surrendered. 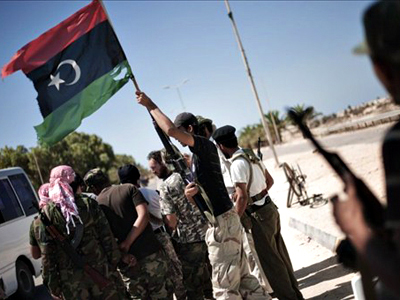 A pitched battle is raging in Libya, with multiple reports of fierce clashes around and inside Tripoli and Colonel Muammar Gaddafi asking Libyans to take up arms against the rebels. 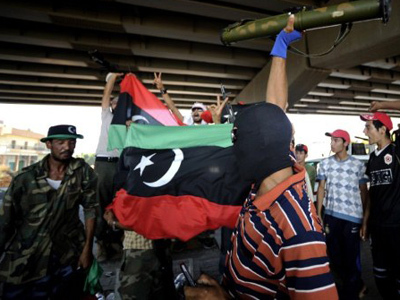 He reportedly called on Libya’s tribes to come to the defense of Tripoli and "cleanse" the capital of rebel forces. Earlier, Gaddafi said he will stay in Tripoli "until the end" and called on his supporters around the country to help liberate the capital from a rebel offensive, Reuters quoted the Libya strongman as saying, citing state television. In a broadcasted audio message, Gaddafi said he was "afraid that Tripoli will burn" and that he would provide weapons to supporters to fight off the rebels. 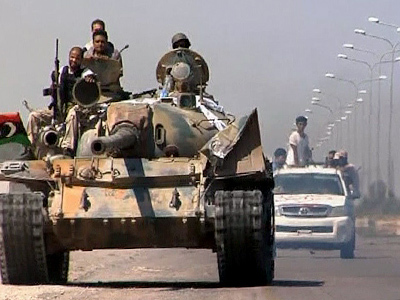 The country's major military base is now thought to be in rebel hands, strengthening their chances of outright victory. 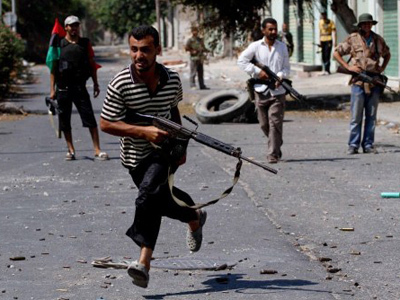 It is also believed that after major clashes the rebels captured Tripoli’s Mitiga airbase. 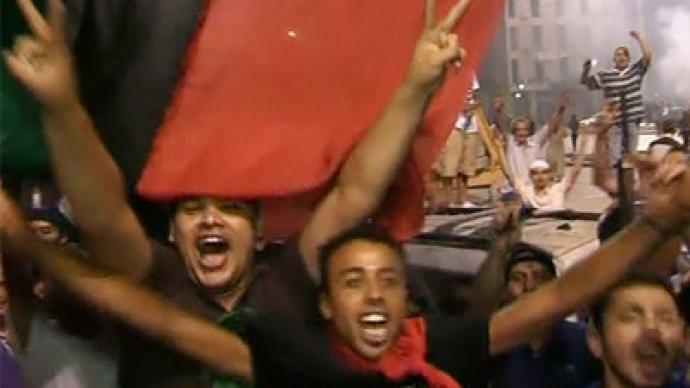 Opposition forces also claim to have freed prisoners locked up during the uprising against Gaddafi's regime. NATO Secretary General Anders Fogh Rasmussen has released a statement on the situation in Tripoli – saying the Libyan people should be spared further bloodshed. A key player in the military campaign against the Libyan regime, Washington, claimed the rule of Muammar Gaddafi is coming to an end. The US is reported to be in close contact with rebel leaders and is monitoring the situation on the ground. “If Gaddafi cared about the welfare of the Libyan people, he would step down now," the US State Department declared on Sunday night. The UK government has called on Libyan leader Colonel Muammar Gaddafi to step down to save his people from further suffering. Earlier on Friday, UK Prime Minister David Cameron welcomed the newly appointed Libyan charge d’affaires to Downing Street, where he underlined his “optimism” for Libya’s democratic future. Meanwhile, President Nicolas Sarkozy expressed his full support for the rebels battling Muammar Gaddafi's troops in and around the Libyan capital. People in Tajura, a suburb of Tripoli, celebrating in the early morning on August 22, 2011 after Libyan rebels surged into Tripoli (AFP Photo / Mahmud Turkia)The UK government has called on Libyan leader Colonel Muammar Gaddafi to step down to save his people from further suffering.“It is clear from the scenes we are witnessing in Tripoli that the end is near for Gaddafi,” read a statement from Downing Street. “He has committed appalling crimes against the people of Libya and he must go now to avoid any further suffering for his own people.”Earlier on Friday, UK Prime Minister David Cameron welcomed the newly appointed Libyan charge d’affaires to Downing Street, where he underlined his “optimism” for Libya’s democratic future.Meanwhile, President Nicolas Sarkozy expressed his full support for the rebels battling Muammar Gaddafi's troops in and around the Libyan capital. "At the moment when decisive events are taking place in the Tripoli region, in Tripoli itself, and elsewhere in Libya, the president salutes the courage of the rebel fighters and of the Libyan people who are rising up,"
Sarkozy's office stated on Sunday night, as quoted by the Reuters news agency. Journalist Mahdi Nazemroaya is in the central Tripoli hotel where much of the international press has been housed. The journalist says that children are defending Gaddafi against NATO's onslaught. Nazemroaya also says that an unconfirmed source told him that people are gathering on Green Square in the center of the capital and are ready to defend their city. “They’ve got arms and they are ready to fight,” he said. ­Political scientist Michael Parenti, based in Berkeley, California, says protecting civilians was just a pretext for NATO to step into Libya, topple Gaddafi and redirect the country's economy.